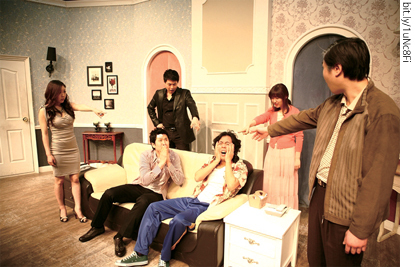 Liar 1 is the longest-running play in Korea, premiered in 1999. Liar 2 premiered in 2004 and Liar 3 in 2001; both are gaining steady popularity. The characters of Liar 1 and 2 are almost identical (the children of John newly appear in 2) but are different in 3. However, none of the stories are connected or must be viewed chronologically. Above all, The UOS Times will talk about Liar 1. The original title of this play is Run for Your Wife, a major works of an English playwright, Ray Cooney. Papa Production wanted to remake the play, so it made a license contract with Ray and premiered the play with the name of “Liar” in 1999. Every character has strong personalities, and the explosive laughter is ceaseless! Let us be fascinated by Liar’s charm! John Smith, a taxi driver, manages a double life in two households with Mary in Wimbledon and Barbara in Streatham. It was perfect until he gets held up at the hospital because of mild trauma from a trivial burglar case. John’s double life would have gone on smoothly if his wives did not report him as a missing person to the police. Troughton and Porterhouse, the detectives, each went to Mary’s and Barbara’s houses. John tries to free himself from detectives’ suspicions by lying. 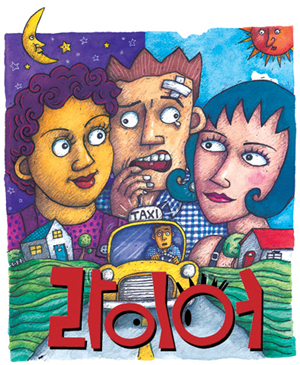 His friend Stanley, an unemployed and laid-back guy, tries to help by lying but only makes the situation worse. Stanley is belied as a farmer and homosexual. Even when John tries to tell the truth, no one believes it. When he finally convinces everyone of the truth, he smiles in relief, and Stanley makes a sad face. The play ends with John suddenly kissing Stanley. Various foreign plays have been introduced to Korea, but there are no plays which have gone on as long as Liar. In fact, there is no scene that leaves lasting impression or resonance on us. Liar does not even have wonderful songs, contrary to famous musicals such as Cats, Les Miserables, and Hedwig. How can Liar consistently maintain the public’s interest? Here are three reasons for its success. You might think that there is no logical flow when you just hear the phrase, a funny and fast-moving play. In this play, you do not have to worry about it. It fully leans towards a logical flow despite a fast-moving development. It did not make the audience and me feel confused. We can enjoy the applause mingled with laughter not having a sense of awkwardness. John often manipulates the truth here and there. It is really smart of him to escape from his situation at that time but he also needs more new lies. During the play, you will be busy laughing because such situations pass by in an instant. After the play is finished, you can realize that each line had significant meanings. It feels good when something is easy. The easier the play, the better we feel, especially for beginners. Liar begins by making itself an “easy and approachable play.” It is ideal for people coming into contact with a play for the first time as that is its main purpose. It includes chuckles which are necessary for comedies, yet it does not neglect satire and humor. More than any other constituent, giggling is the most important thing in Liar. Pride that the play holds becomes obvious when you just have a look at the poster. There is a warning that says “You can faint from laughing.” It plants an expectation into the audience’s minds, and lives up to it. In fact, this play actually is full of elements that provide sufficient laughter to fulfill this expectation. Satire and humor can be too difficult to comprehend when overdone. However, when considering the goal of this play, satire and humor are just enough in the play. Liar shows situations in which lies are used to cover up other lies. Through this, the pretense of people to act and explain falsehoods as truths is revealed. It can be a heavy subject if handled seriously, but here it is used to entertain and refresh. A burst of laughter is the great thing about this play that cannot be emphasized enough. Liar starts with light laughter. As the show continues, the pace picks up and chances to laugh become more frequent. As time goes by, John Smith experiences more difficulties and tells another lie in hopes of it providing a temporary expedient. Those lies, however, make his situation even stickier. John feels more distressed and the other characters are also in a state of confusion, but the audience is laughing to the point of feeling faint. The acting capability is just as important as the play’s plot. Most of the reviews from audience are full of praises. The actors play with strong personalities and maintain animated performances and rapid development on the play. They say, “Simple is the best.” Liar returns to a simple idea and provides an understandable play for everyone. It opens the beginner’s mind and will make you laugh on and on without giving you any time to think about something else. Do you have any worries? Then reserve a ticket for Liar. Come back after yakking it up for 100 minutes. When the play ends, your heart will have lightened a lot.